Editor’s Note: Today’s guest post is by Kelsey Hadaller of Hanapin Marketing. Learn how to be successful with Smart Display campaigns! The rollout of Smart Display campaigns was announced by AdWords in April 2017. Nearly a year later, the campaign type is still available but not many advertisers are talking about it. With the increase in automation opportunities within AdWords, Smart Display might be a good test for your accounts as an intro to automation. Who Should Test Smart Display? 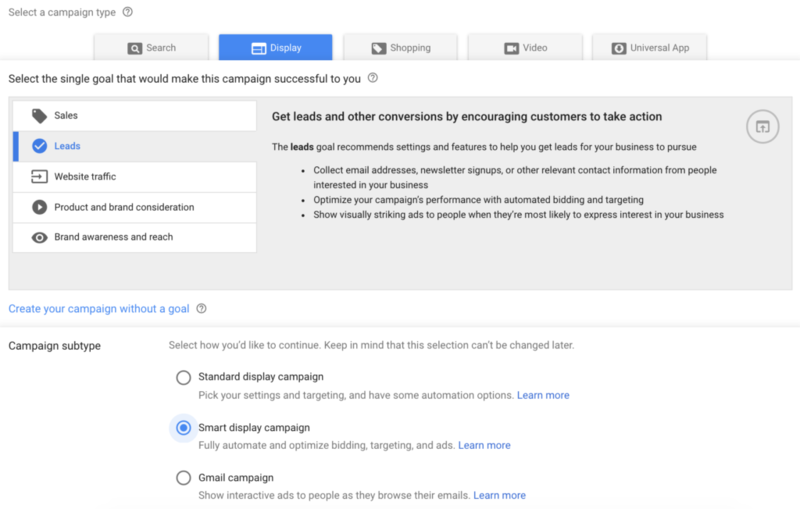 In the new AdWords UI, you can find Smart Display campaigns under the Display campaign type when using a sales, leads or website traffic goal. You’ll then be prompted to select location and language targeting, a daily budget and a Target CPA. Google reps often recommend using a daily budget greater than 20 times your Target CPA. While this might be a best practice for accounts with low CPA goals, a high daily budget isn’t always realistic or necessary. Even though AdWords automates the final ad, you still have control over components of the creative. Have headlines, description lines, logos and images ready before you create a Smart Display campaign. Refer to the AdWords guide for specifics. Keep in mind that you cannot control many aspects of Smart Display targeting and bidding. For example, to exclude an automated placement, you must set up the exclusion at the account level since campaign placement exclusions are not available in Smart Display. Device modifiers are also unavailable in this campaign type. 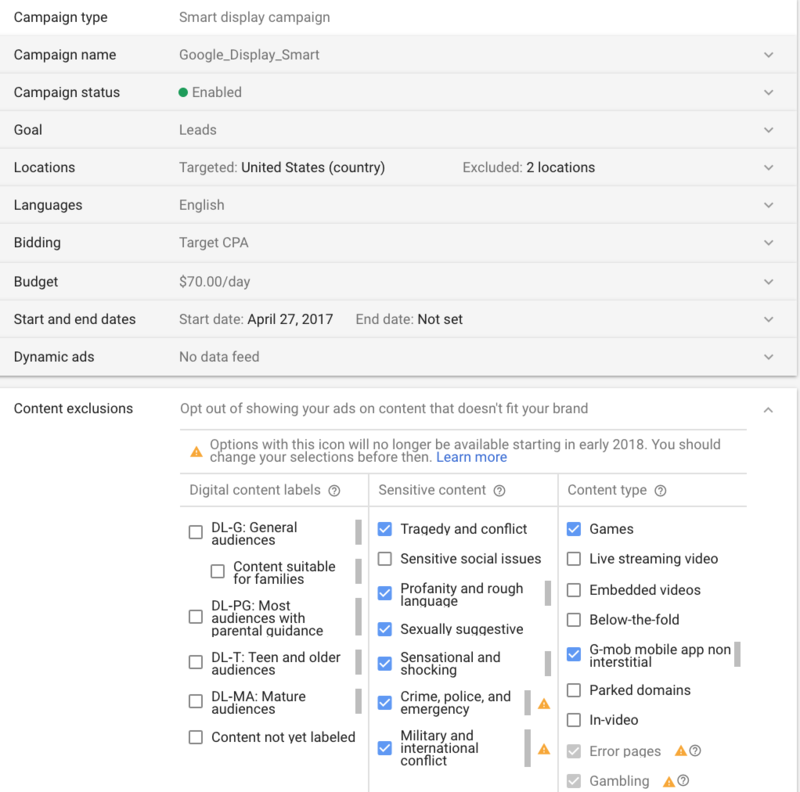 As you can see below, however, AdWords does allow content exclusions to be applied in Smart Display campaigns. These Smart Display campaigns were launched in April 2017 and have performed at a steady ROAS throughout the year. Keep in mind, these campaigns are using last-click attribution. When using other attribution models, ROAS is even stronger for these campaigns. Target CPA for these campaigns range from $50 to $75. This is a lead generation account with high revenue per conversion action. The below Smart Display campaign ran for only one month and was paused due to poor performance after not converting with $251 in spend. If you decide to test Smart Display, let the campaign(s) run for at least three months. You can’t expect to see over 300% ROAS immediately since the campaign uses visitor behavior to optimize the target audience and placements. Again, this is why testing budgets are a must for this test. Top of funnel Display layered with extreme automation doesn’t sound like an equation for low cost conversions, but it’s possible! Share your experiences with Smart Display in the comments below. Kelsey Hadaller is Senior Account Manager for Hanapin Marketing. Follow her on Twitter at @khaddy_ppc.